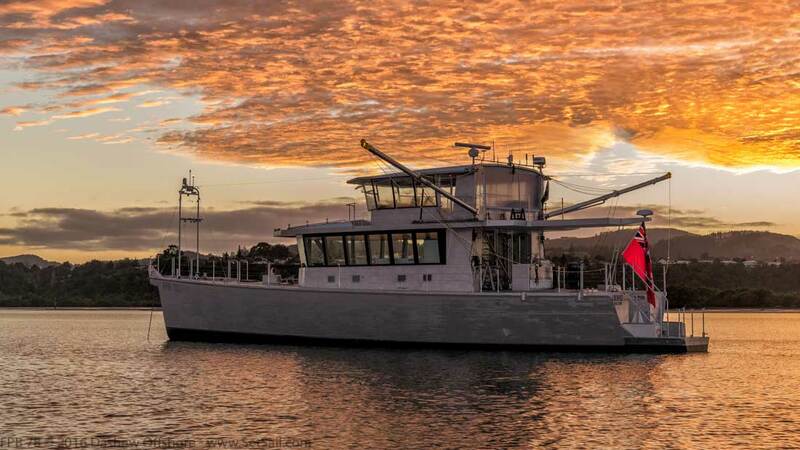 Consider: FPB 78-1 Cochise has put 12,500 nautical miles in her wake in four months of enjoyable, easy cruising. This includes a comfortable (!) 4,700 nm upwind passage from French Polynesia to Panama, against the prevailing trade winds and currents, at an average speed of ten knots. She made port with sufficient fuel to go another 1,200 nm to Florida. 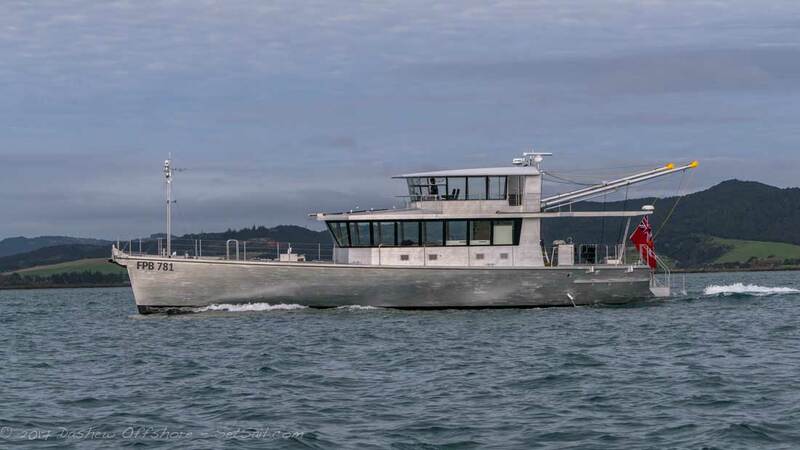 More recently, she averaged 14 knots on a 500 nm coastwise cruise along the eastern seaboard of the U.S.
FPB 78-2 Grey Wolf averaged 11.6 knots on her maiden ocean crossing from New Zealand to New Caledonia. 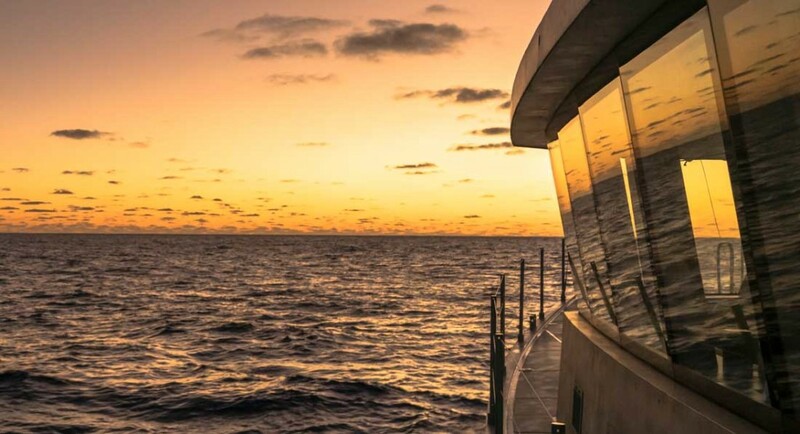 The ability to maintain high average speeds for ocean crossing distances, with standard integral fuel tanks, is the key to making the weather work for you rather than against you, while reducing exposure to dangerous conditions. 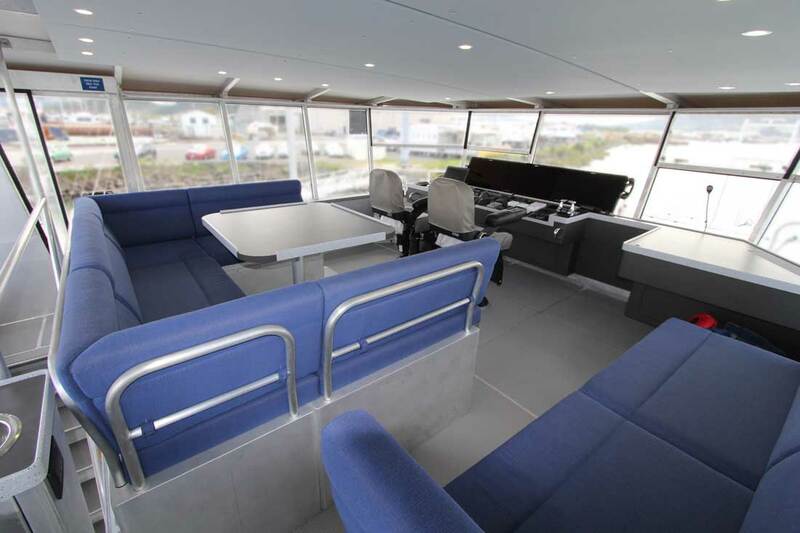 With the speed, range, comfort, and security the FPB 78 brings to the cruising equation, you can see why we call it the “Dream Machine”. 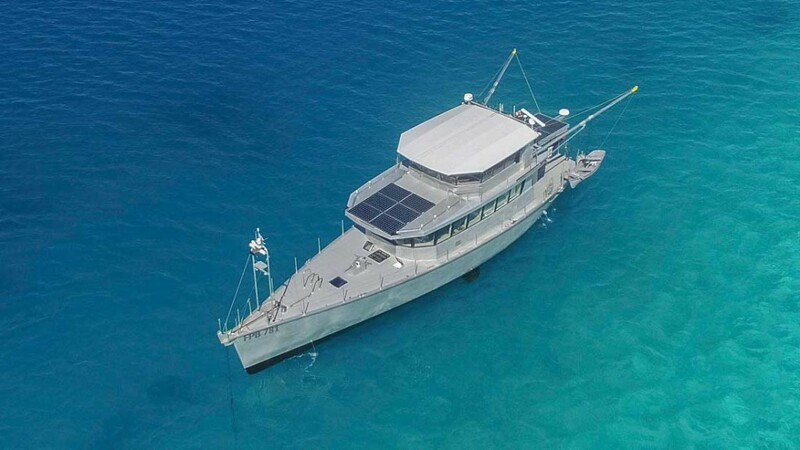 Careful systems engineering, powered and highly effective natural ventilation, a massive traction battery bank and large solar array allow the FPB 78 to sit for days without using her genset. In temperate climates the Next Generation FPBs have almost no carbon footprint, other than the small amount required for passaging. 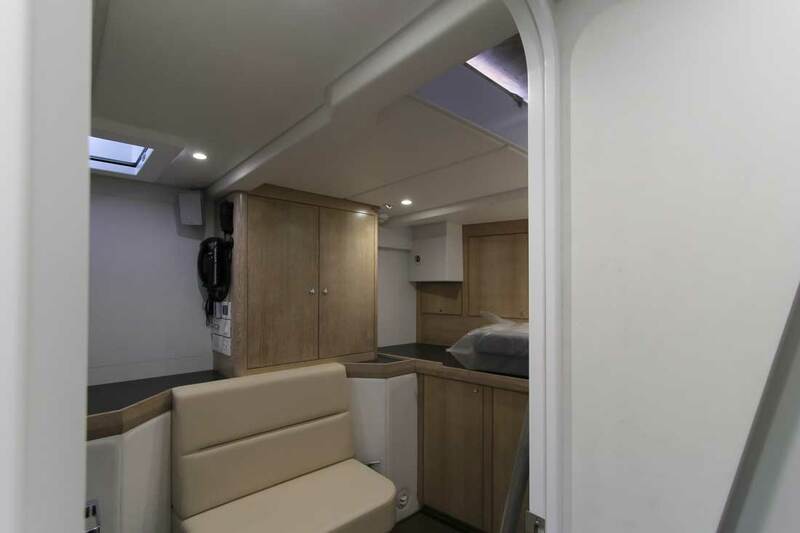 The easily maintained and purposeful military-like exterior hides a luxe interior, with significantly more volume than was possible with earlier FPBs. And it is as comfortable underway as it is beautiful in port. …as rewarding as being there. 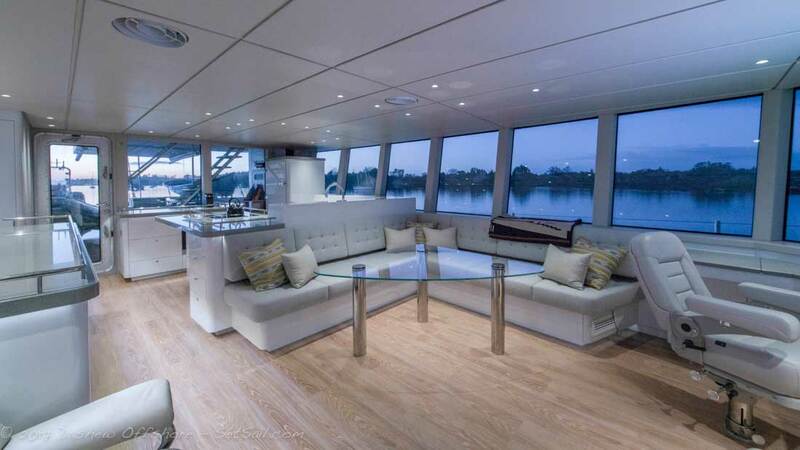 And while the interiors are easy on the eyes, they are first and foremost developed for comfortable voyaging. 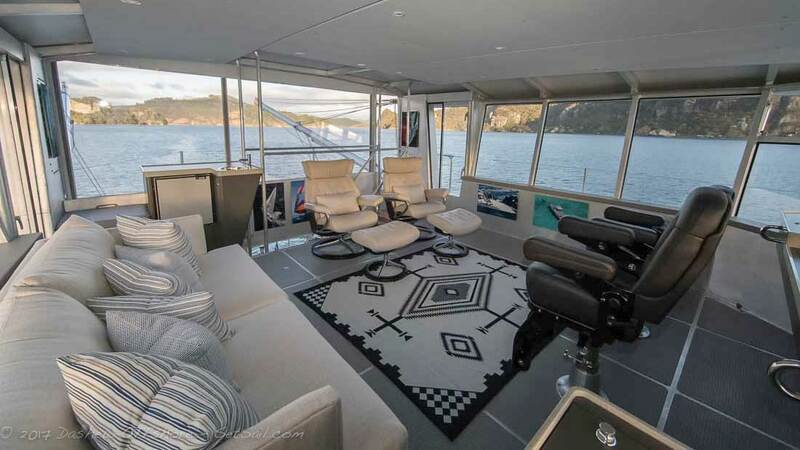 …and a favorite lounging area at anchor. …this FPB 78 Dream Machine is the way. 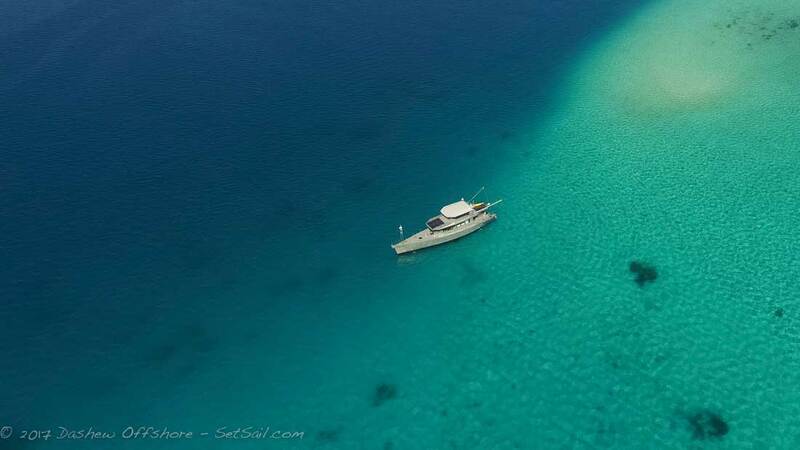 In order to fully understand the FPB concept and why we do what we do, you need to experience these boats offshore. 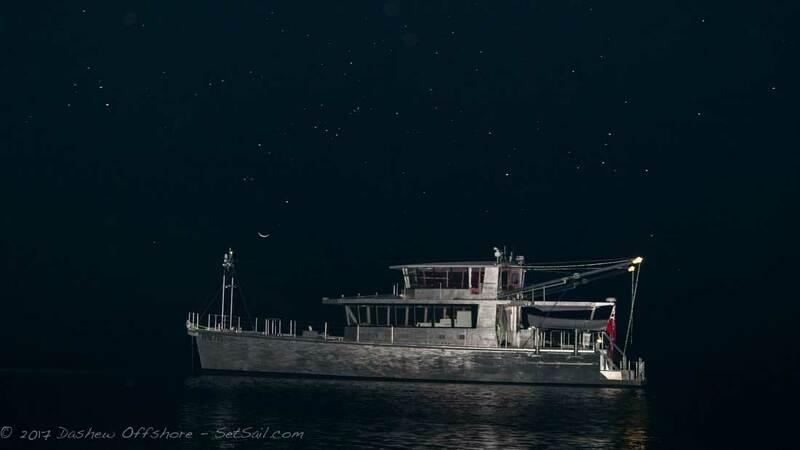 However, the reality is that most people don’t, so we invite you to come aboard in our videos. 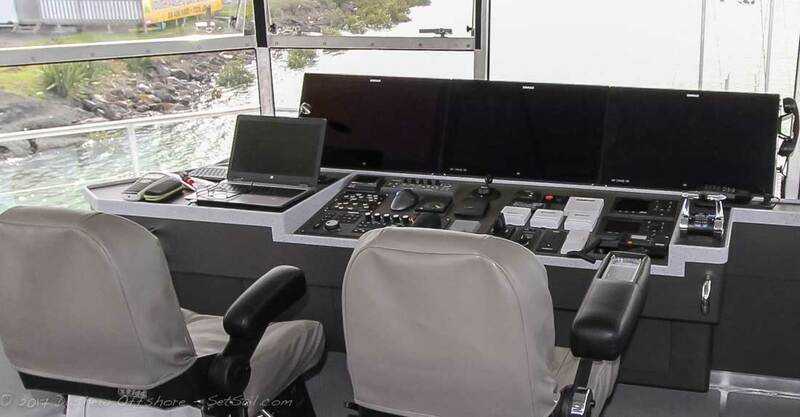 Here you will find an emphasis on what others would call heavy weather, and you can judge for yourself the motion, tracking, sound and comfort levels that FPB crews experience. 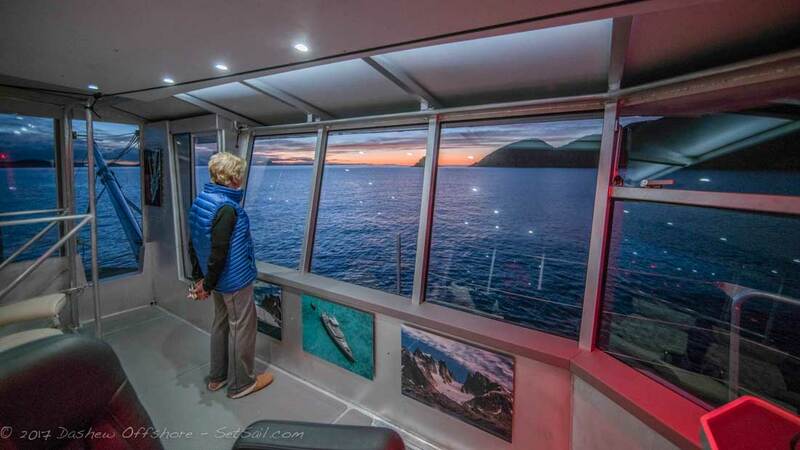 When you combine these ocean-crossing capabilities with the ambience that you will see in the rest of this post, we think you will understand why we consider the FPB 78 to be our Dream Machine. Okay, enough prologue, let’s get into the details of this first of the Next Generation FPBs. We will start our tour in the Great Room of the FPB 78. 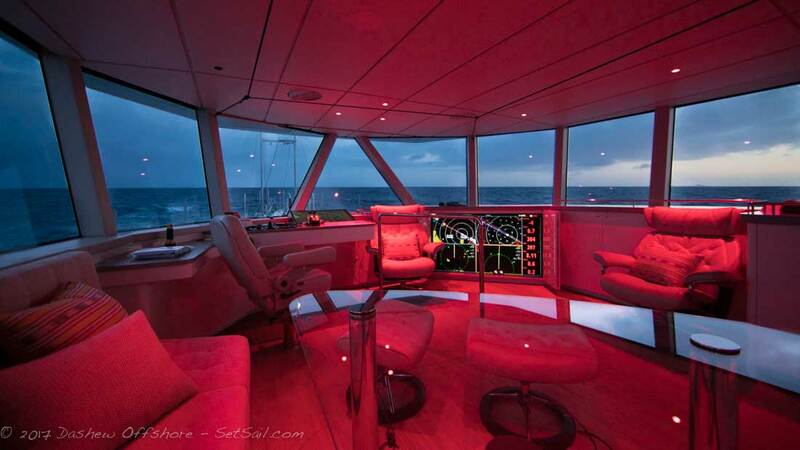 This is one of several focal points for life aboard. 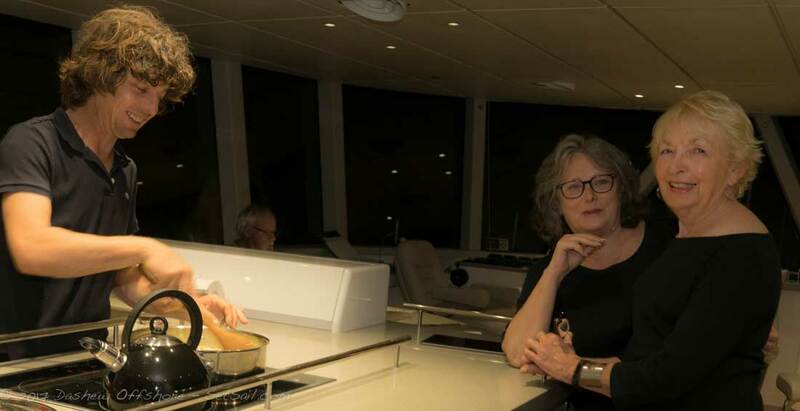 The galley, breakfast bar, salon, theater, and one of the two helms are situated in the most comfortable region of the hull. When making shorthanded passages, this great room layout allows for ease of communication and togetherness. …offers an unobstructed view of the world outside. When coastwise, the Matrix deck is the primary con, but on passage the inside bridge is often the watch standing station. There are excellent sight lines from this location. 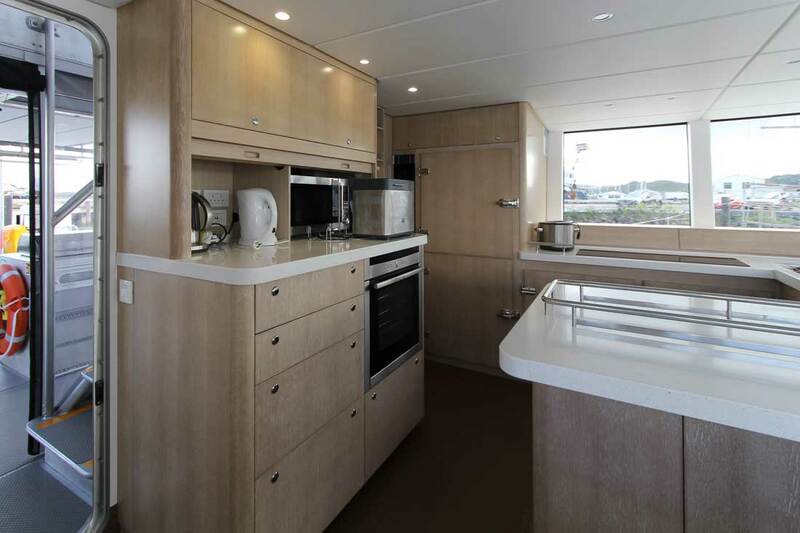 …and at anchor, with room to cook efficiently while chatting with guests or helpers. There are substantial bulk stores areas, lots of drawer storage, and room for a variety of appliances. 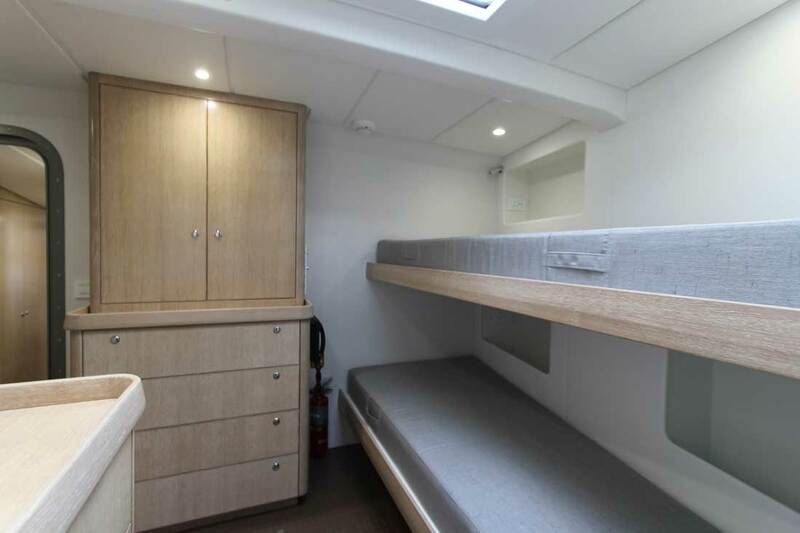 There is even more storage with this layout aboard FPB 78-2 Grey Wolf. A combination of direct and indirect lighting throughout the FPB 78 offers endless possibilities for work and mood lighting. 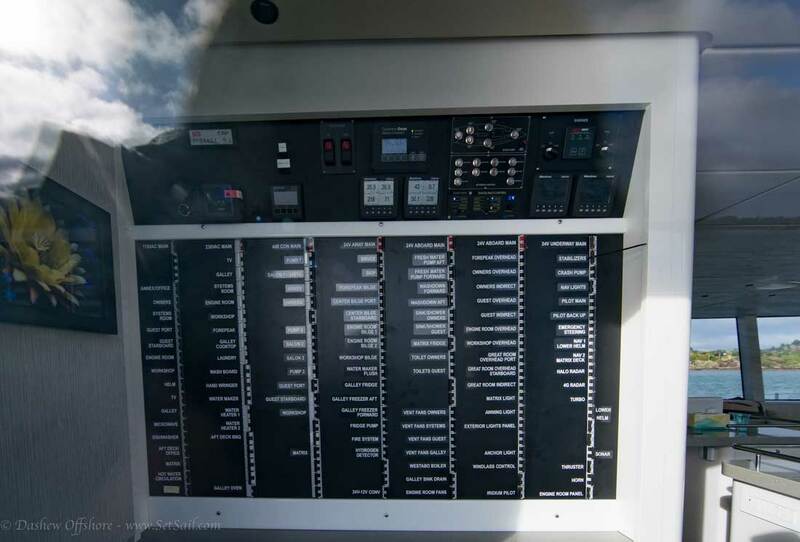 The ship’s master systems panel is located in the aft starboard corner of the great room, where it is easily visible, but the lighting does not impact the helm. The design allows you to wedge yourself in securely in rough weather. The majority of AC and DC breakers are located here, as are the genset, inverter controls, heater and air conditioning, fridge and freezers, plus the John Deere Powerviews, and great room lighting circuits. Turn around and you are looking at the stairwell to the lower deck. 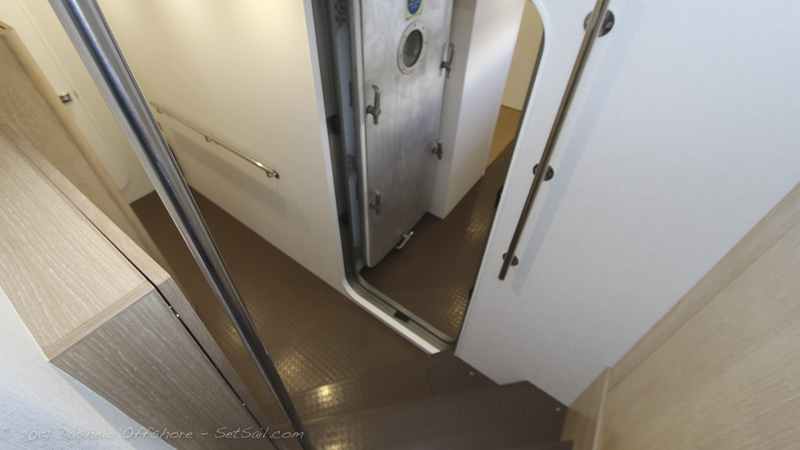 At the bottom of the stairs, owner’s quarters are on your right, forward, with guest cabins aft, on your left. 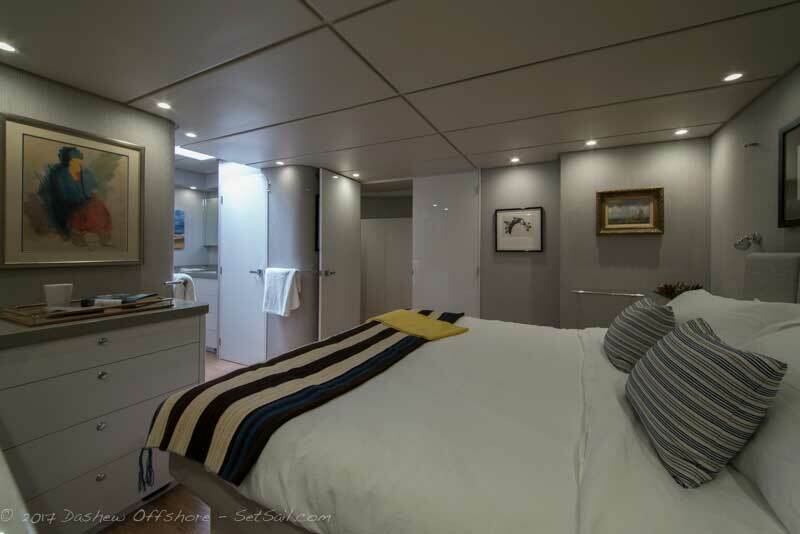 We are looking forward now, down the hallway of FPB 78-1, which leads to the owner’s suite and forward cabin or forepeak. 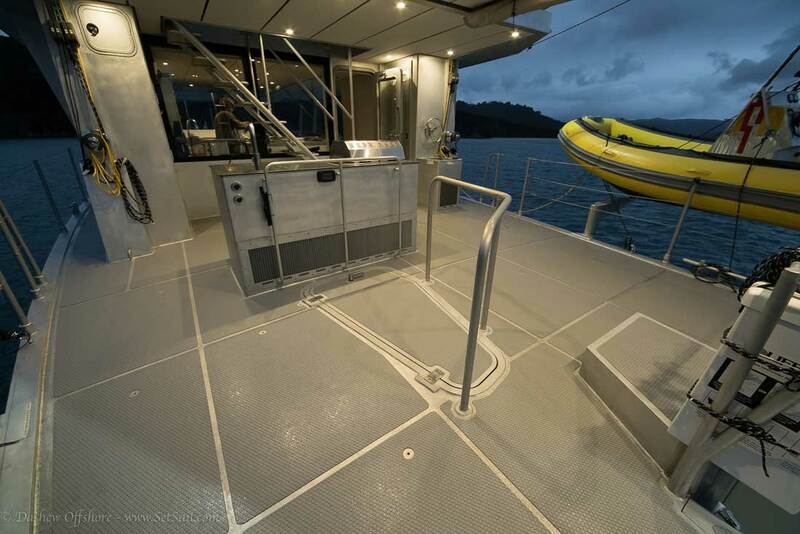 FPB 78-2 above shows the edge of the watertight door which divides the accommodations deck. 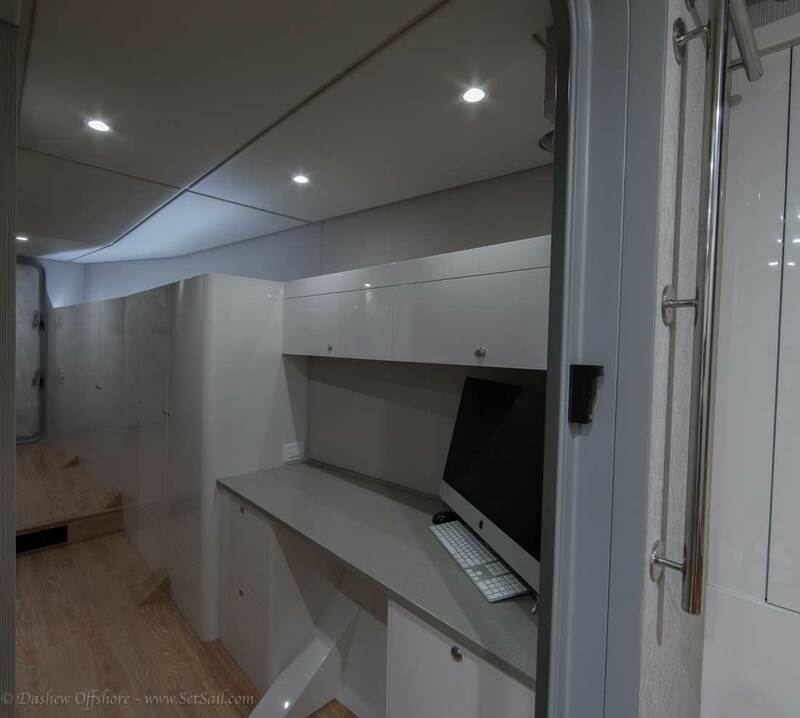 All three of the FPB 78s have this area configured with a large desk and a length of lockers. Grey Wolf is shown in the preceding photo, Cochise is directly above. 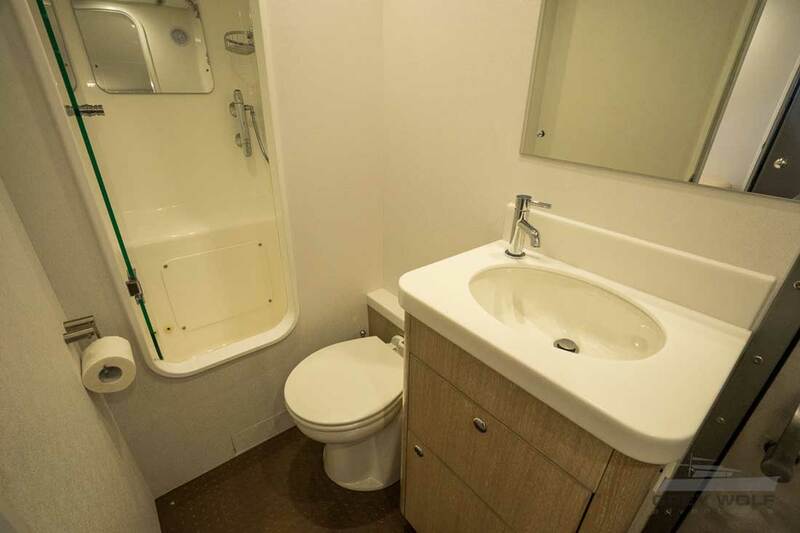 There is not a lot to say about the owner’s suite that these photos don’t communicate better. 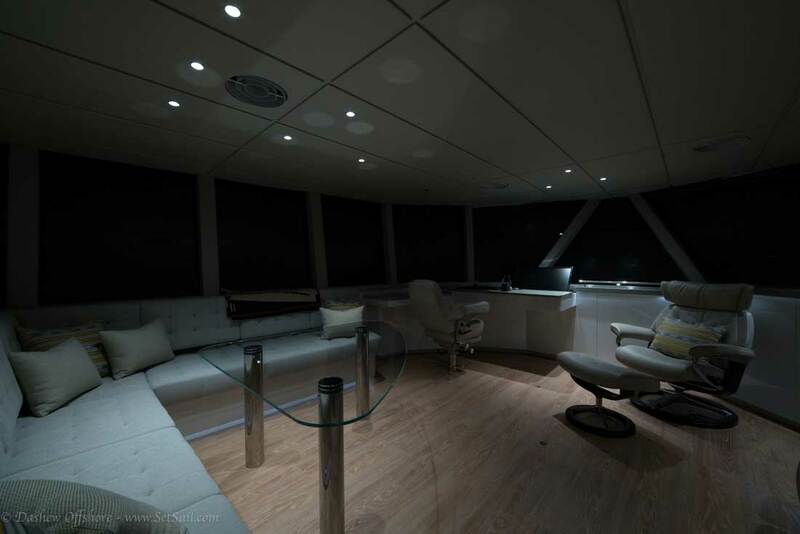 There is enough space and ambiance that if you want to get away from guests or crew, this is an ideal private lounge. 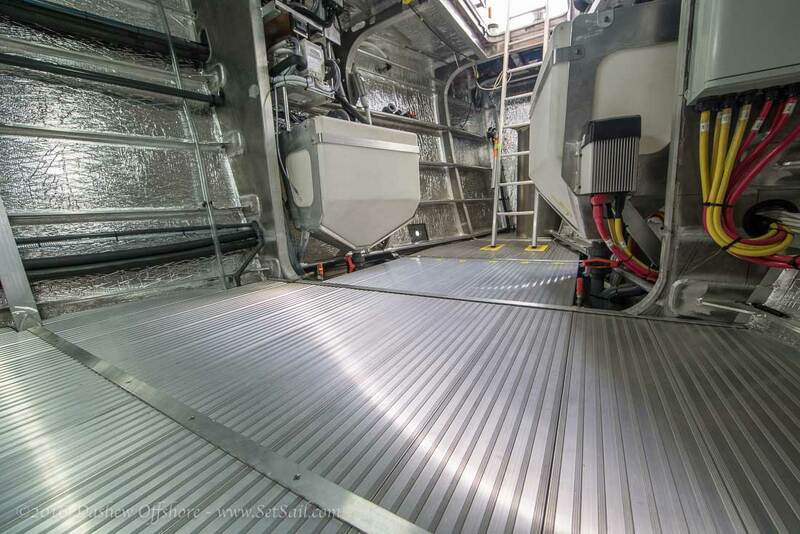 Its location ensures quiet–there are three sets of double isolation bulkheads between here and the engine room. …is easily closed off from the office if there is a night owl at work. 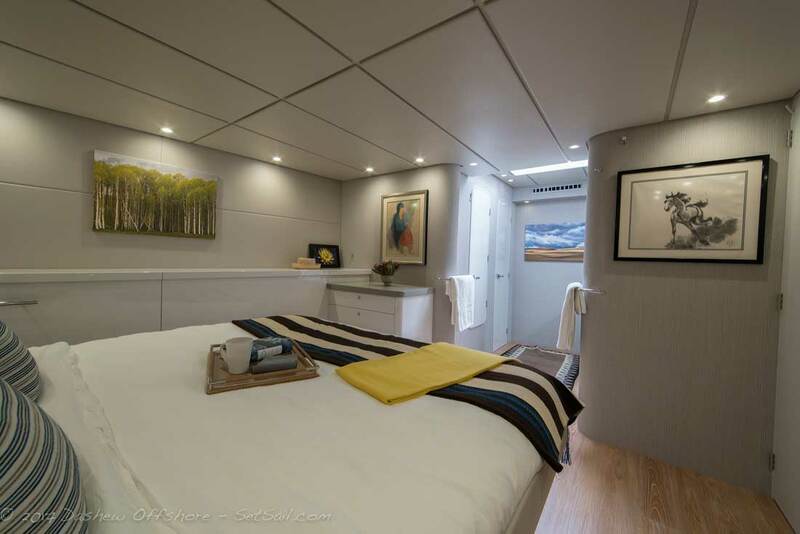 With guests or crew aboard who need access to the forward area – which can be configured as laundry/pantry/gym, or as a stateroom – this becomes a hallway. 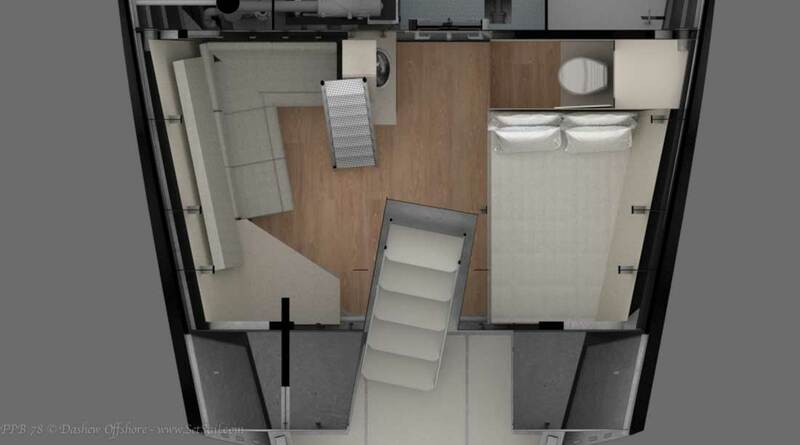 Here is a plan view showing the owner’s suite with its bulkhead in open mode, with the annex set up as a workout space. 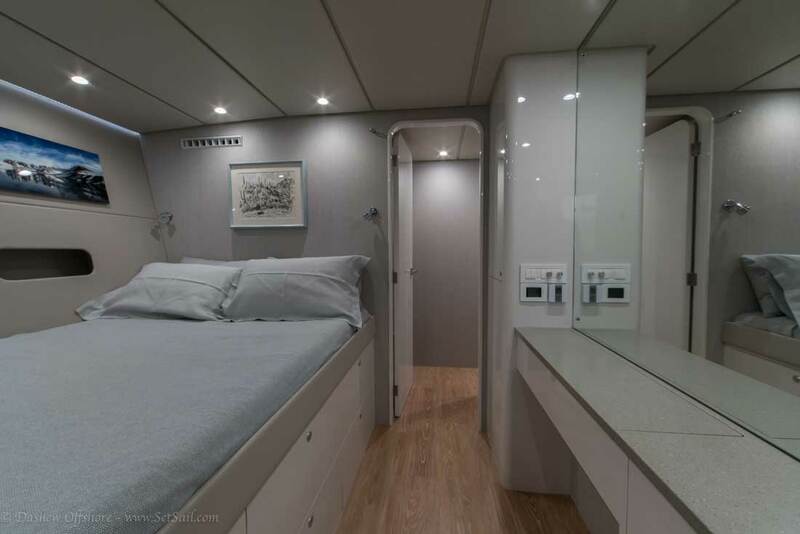 Above is a look at the accommodations deck for FPB 78-2, with the aft end configured as crew quarters, the forward annex as an extra guest cabin and the owner’s starboard bulkhead positioned in what we call privacy mode. 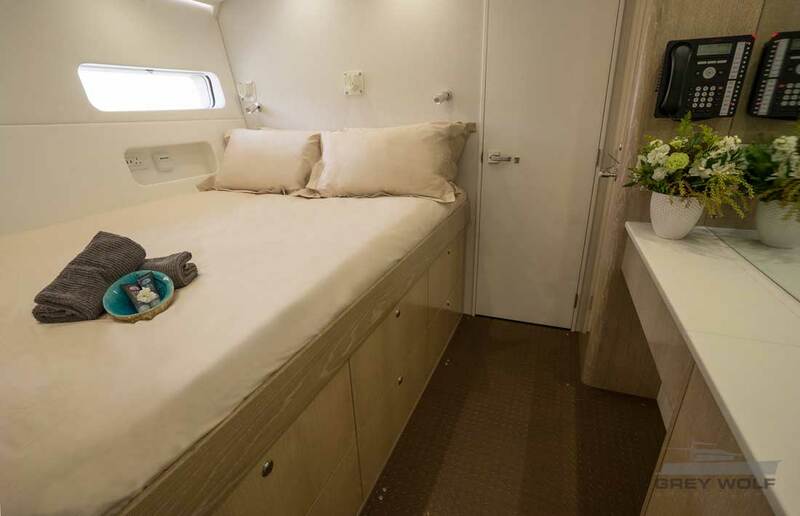 FPB 78-2 starboard guest cabin below. 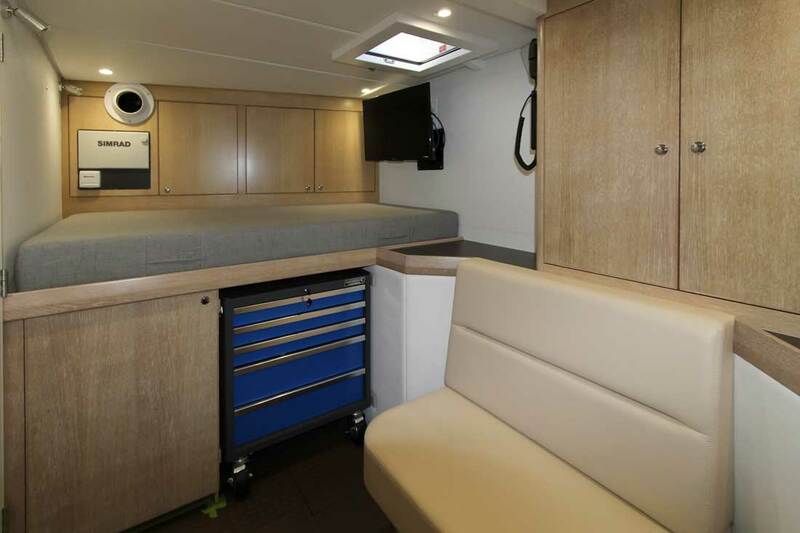 …generous drawer space under the bunk. 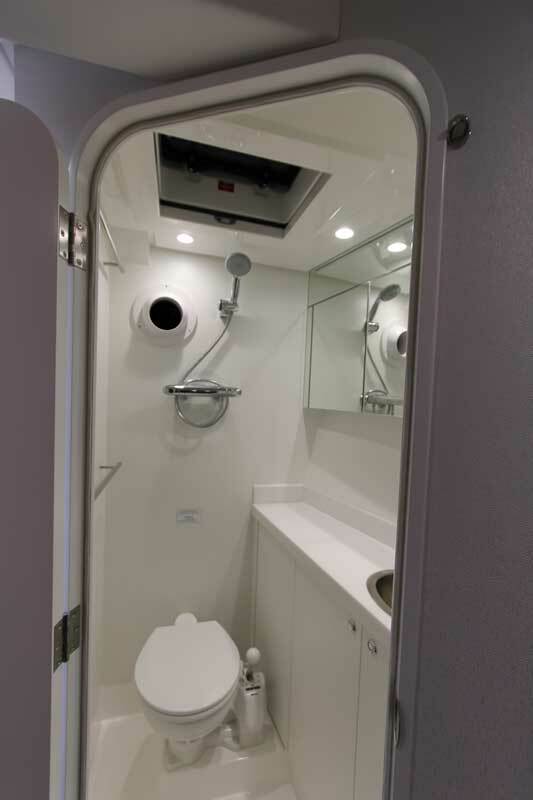 The head and shower facilities are en suite, and work extremely well at sea. Moving aft we come to the engine room, with its pair of of six-cylinder John Deere diesels. 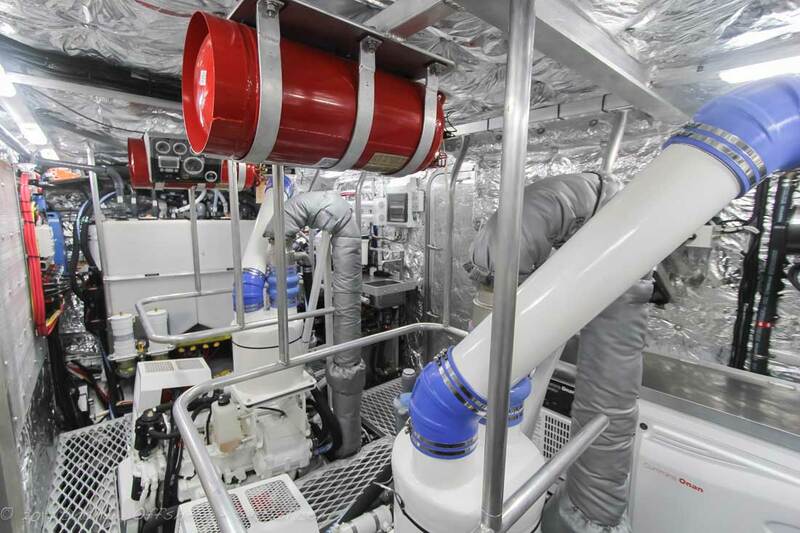 The full width engine room with its stand up headroom has excellent access to systems for visual checks when underway, as well as maintenance. 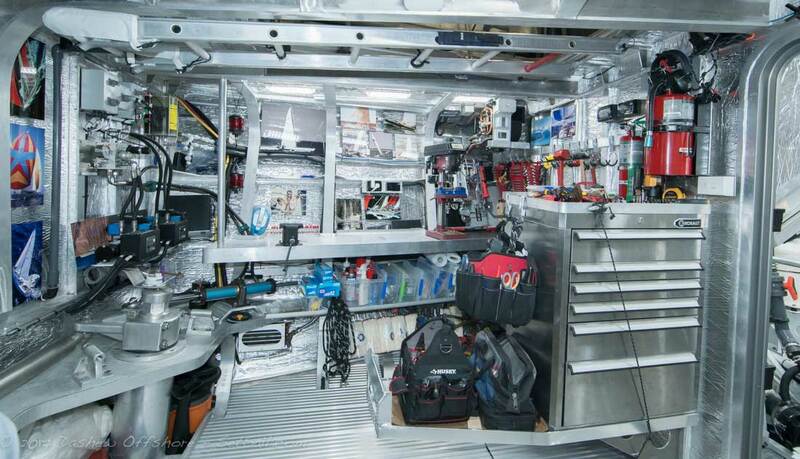 There are beams overhead for lifting engines and genset, and a large work bench. There are a variety of ways to use the aft end of the FPB 78. 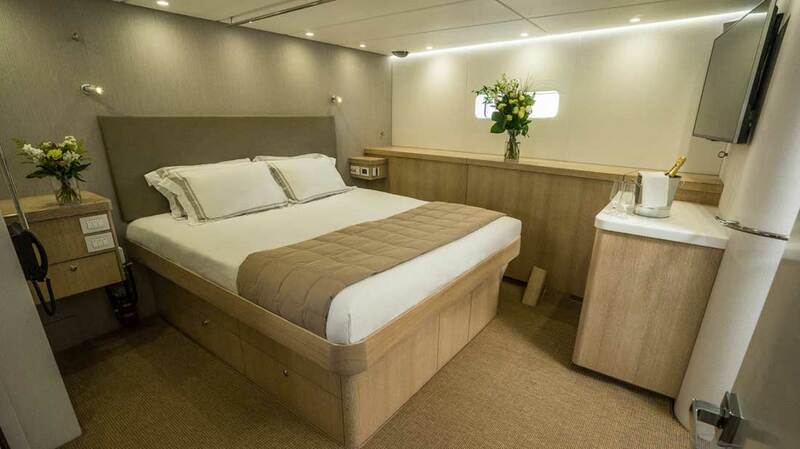 If there is to be crew aboard, this is most probably where they will reside. 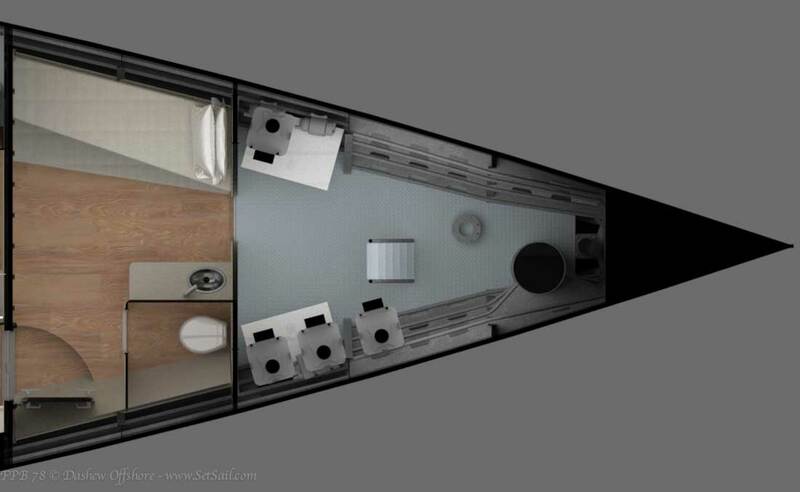 One of many possible layouts is shown above and below, the result of much feedback from owners who have had crew in the past, as well as professional sailors. The one thing everyone agrees on is that the boats with the best quarters get the best crews. 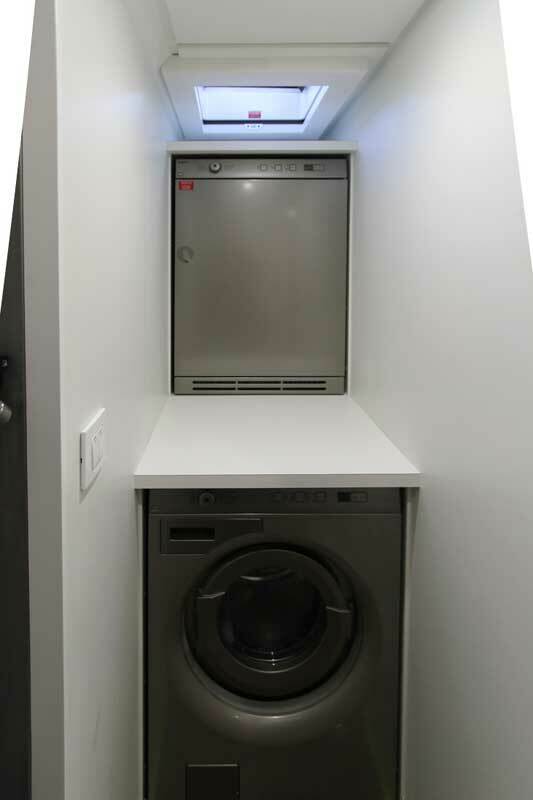 …with the washer and dryer located here as well. On the other hand, there is this made-in-heaven workshop, with adjacent hang out/relaxing area, which is how FPB 78-1 and 78-3 are starting life. In what we are calling the “Executive Lounge” you find to port there is a large work bench, room for a drill press, bearing press, etc. 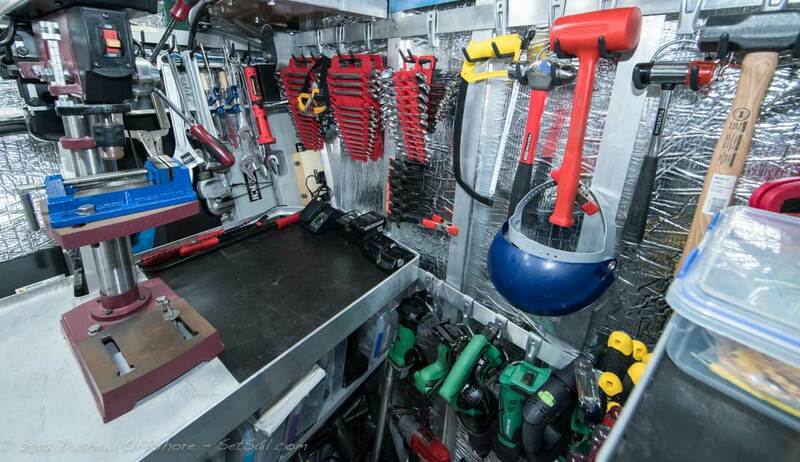 Tools can be neatly arrayed, which makes finding what you need when you need it that much easier. 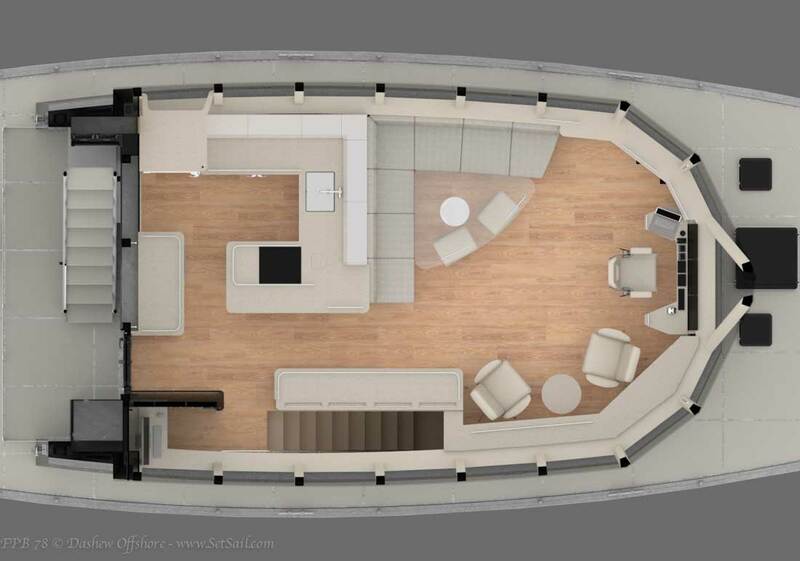 There is room under the floorboards of the “executive lounge”, for 90% of the large inventory of spares that are a standard part of the FPB system. 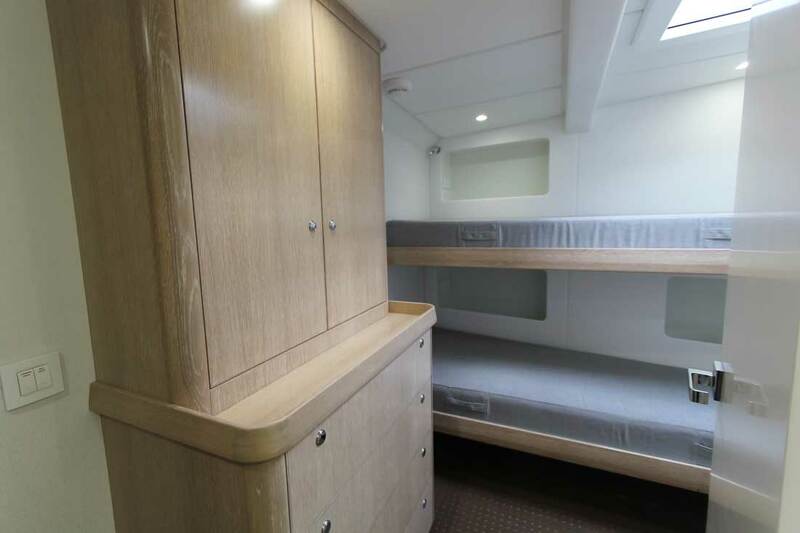 The starboard side (not shown) has a double bunk with lots of storage below, and a head/shower arrangement. 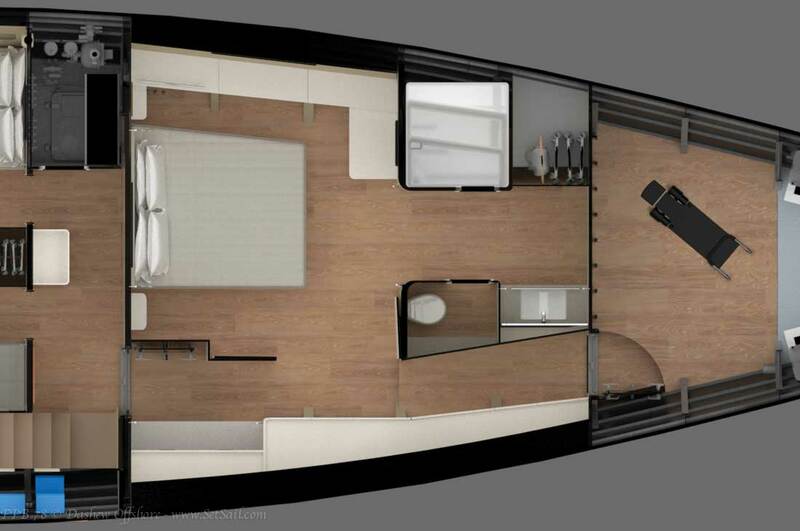 The area forward of the owner’s suite measures 18.5ft/5.7m in length, enough space for a variety of uses. The layout shown above, as one big room, is how the first and third FPB 78s are being done. 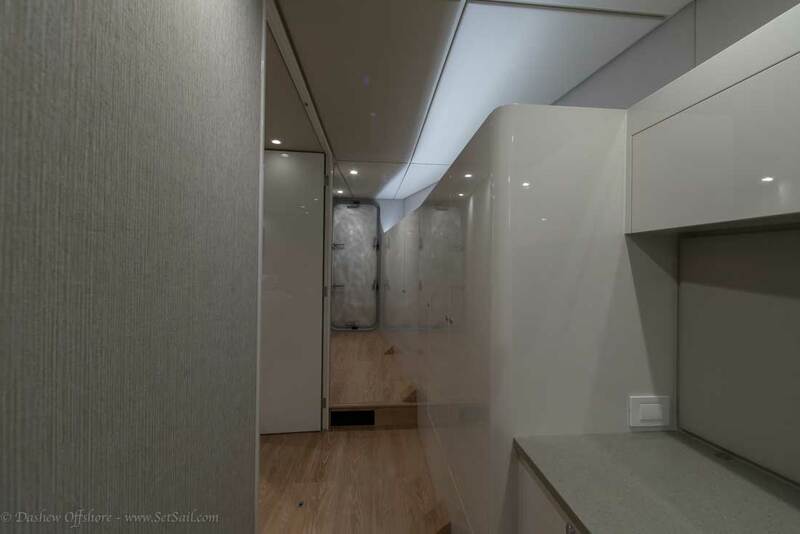 …large office suite/library, or even a walk-in closet. 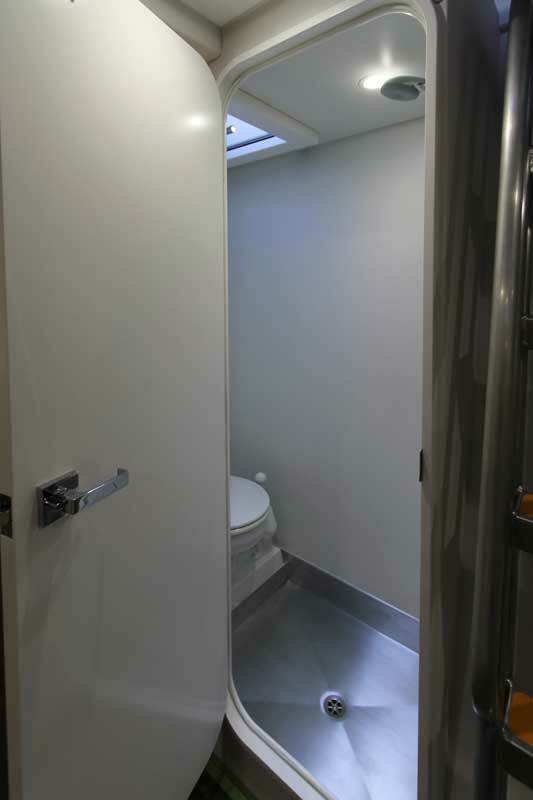 …plus en suite head and shower. The Dream Machine is the second FPB designed to have a Matrix deck. This provides maximum flexibility to adapt as cruising needs change. 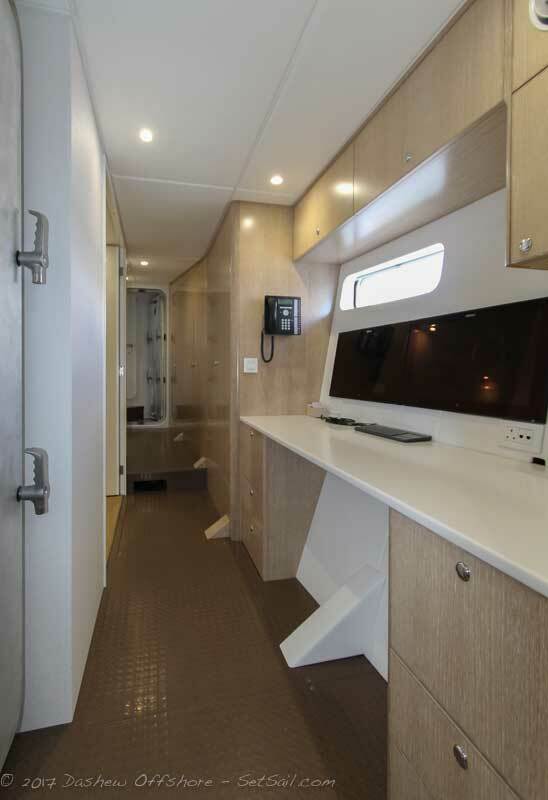 FPB78-1 Cochise and 78-3 are using conventional furniture, which is easily modified as needs and desires change. 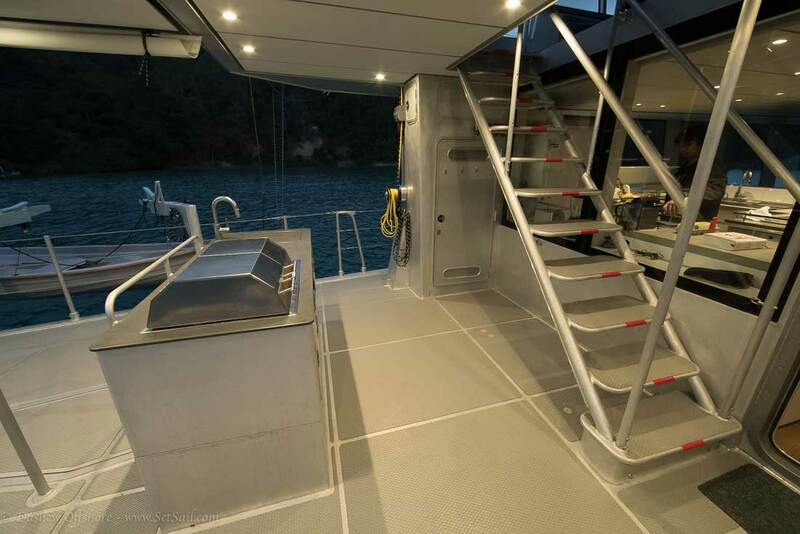 FPB78-2 Grey Wolf has had Circa custom build their Matrix deck furniture. 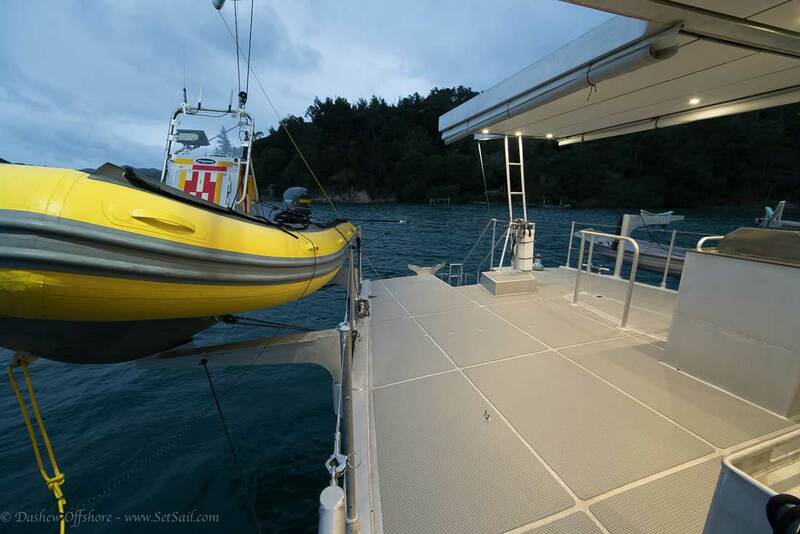 The Matrix deck can be enclosed or left open as weather and inclination dictate. 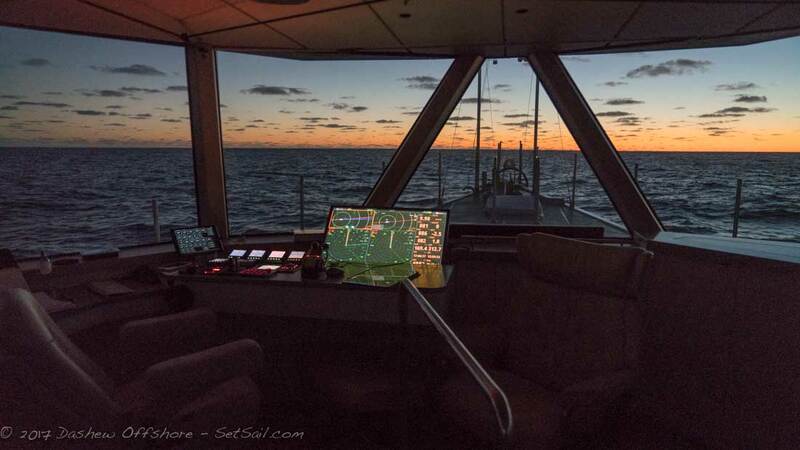 On soundings, navigation has the benefit of elevated sight lines and a full array of electronics. 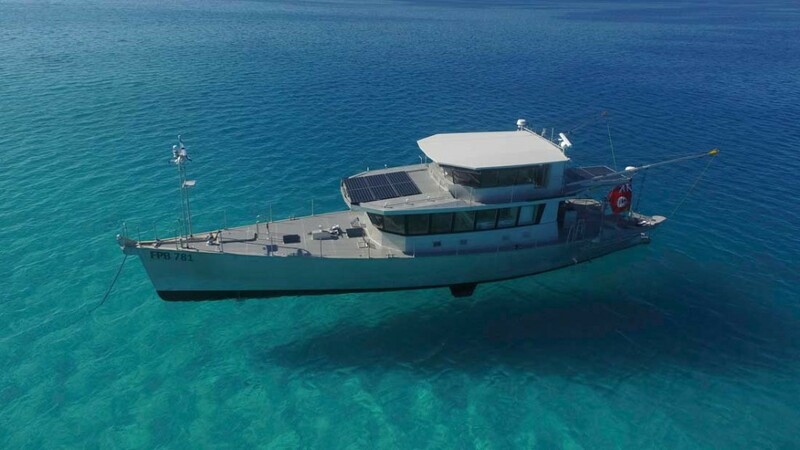 Shallow draft, under five feet/1.5m, opens a new chapter in exploration potential for yachts of this size. The ability to “dry out” is a direct benefit. And when the fins or props need cleaning, this is an easy way to get the job done. We started out talking about efficiency. 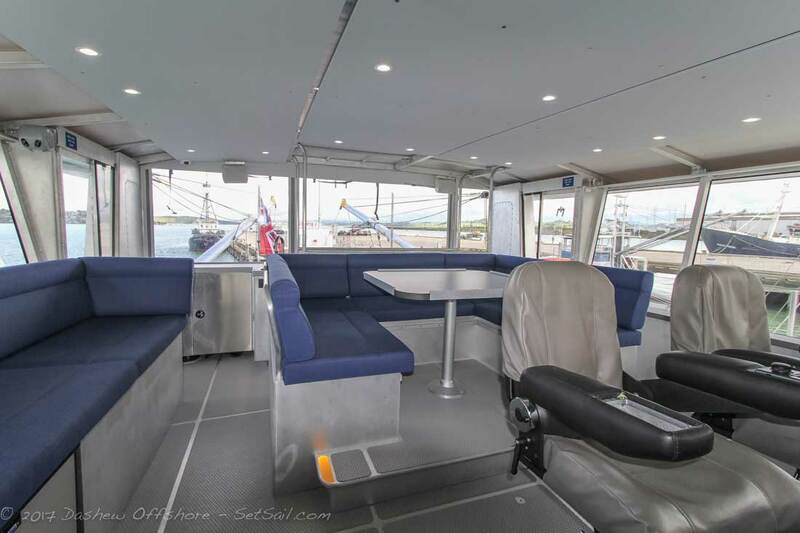 Each step along the FPB evolutionary path has brought us better systems, more ambiance at anchor, and less generator time. With the FPB 78 we are at a point where the generator is rarely needed, unless air conditioning loads are high. 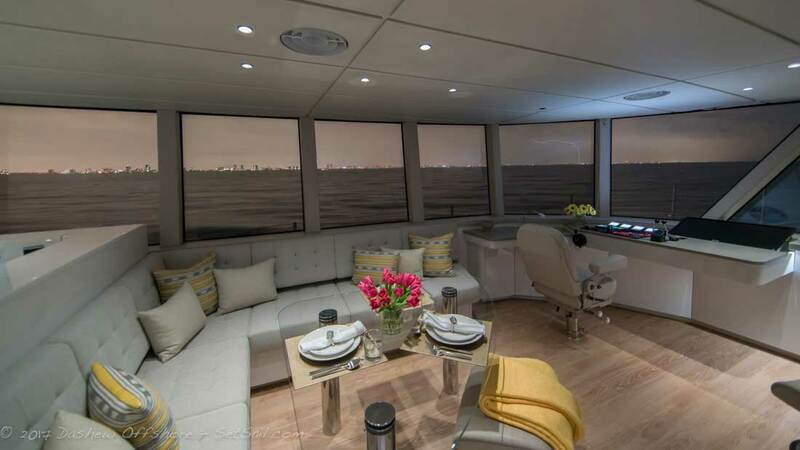 There are a series of factors with the FPB 78 that make for generator-free cruising. 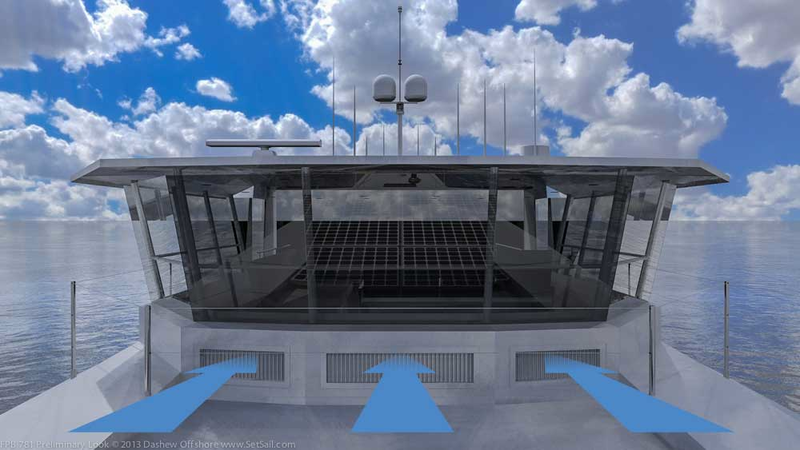 First are ten 340 watt solar panels, capable of providing sufficient power at anchor to take care of the 24-volt DC loads as well as a portion of the air conditioning. Sophisticated systems integration, massive amounts of insulation, carefully engineered shading and ventilation all play a part. 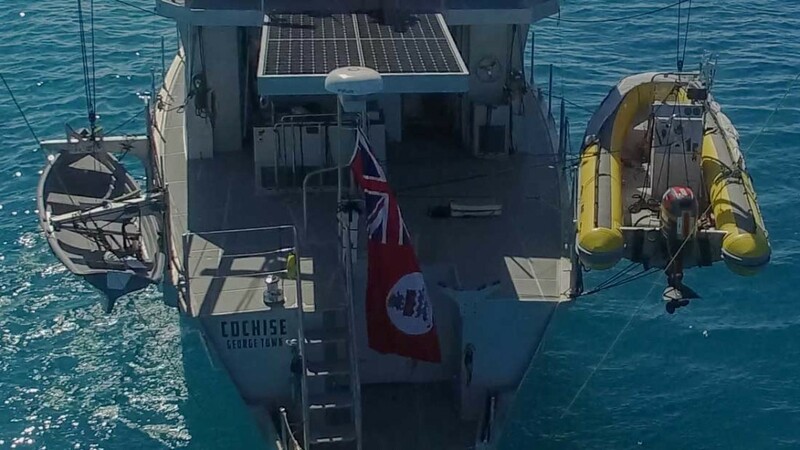 At anchor in Fiji, Cochise averaged 15kW hours per day from the solar array. 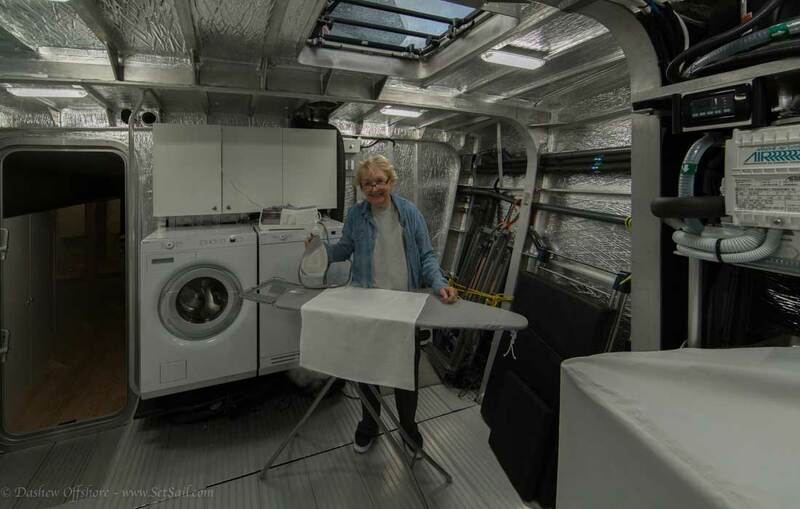 She spent the winter at a dock in Fort Lauderdale without shore power, while using a fraction of the available solar power. This leaves the massive capacity of the 24 volt house traction battery bank, 1600 amp hours (20 amp hour discharge rate), to deal with cloudy days, and/or extra AC circuit loads. With excess loading beyond the solar capability likely to be moderate, you can sit pleasantly at anchor for days on end, waiting until you are underway for any recharge required. And once those diesels are turning, a pair of 250 amp (28V) alternators rapidly recharge the batteries. The X factor in this is air conditioning, which we are dealing with in several ways. First is a reduction in air conditioning requirements as a result of the passive air flow system. 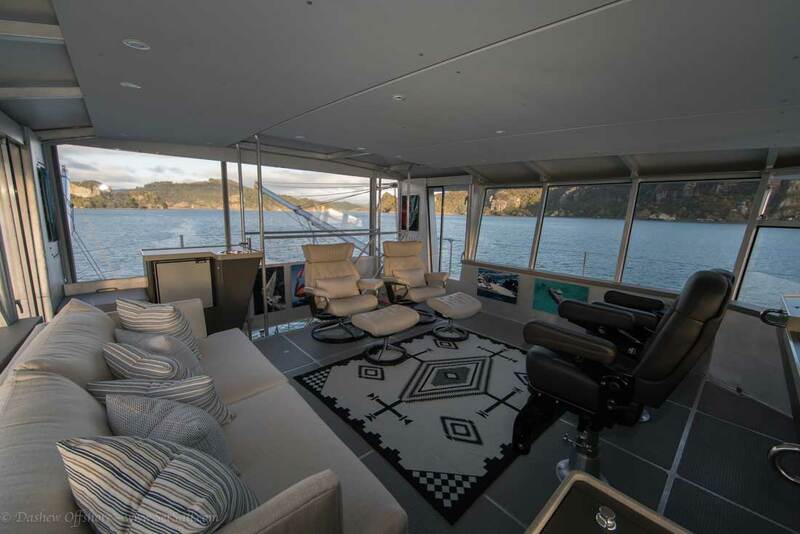 Naturally pressurized air flow from a series of inlets on the underside of the forward roof overhang and front of the Matrix deck coaming keeps the great room temperature in check. When the air is still, a pair of extraction fans in the aft port corner pull fresh air from the passive vents forward through the interior and out the aft end of the house. These extraction fans also work as a galley exhaust. 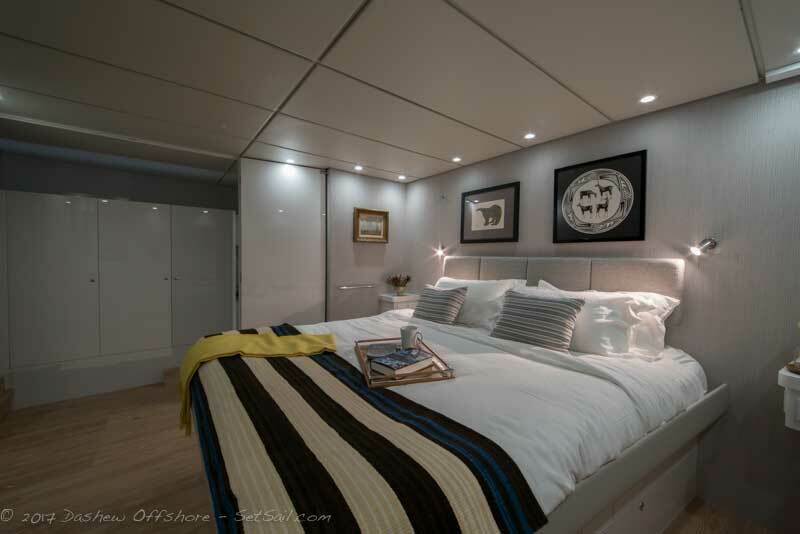 The staterooms have a system of Dorade pipes – each fitted with a fan – one for extraction and a second for pressurizing. Heat load in the great room is reduced with big overhangs forward and aft, the outward angle of the windows, with overhangs beyond. In addition, there are high efficiency cellular shades on each window. Couple this with three times the insulation of previous FPBs and you will understand why the air con loads are so reduced at anchor. 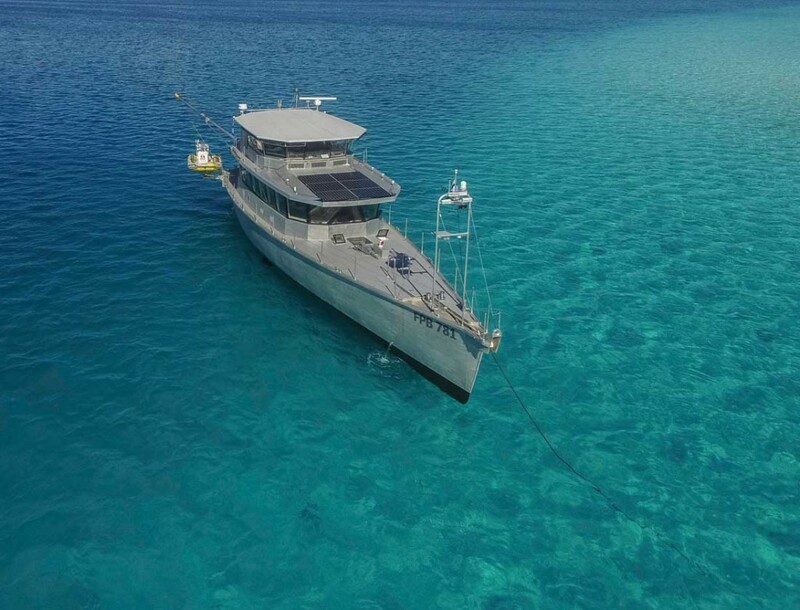 And if it is one of those hot, sticky, end-of-the-season nights in Fiji or the Bahamas, where air conditioning would be ever so nice while sleeping, the battery bank will supply power for the compressors. 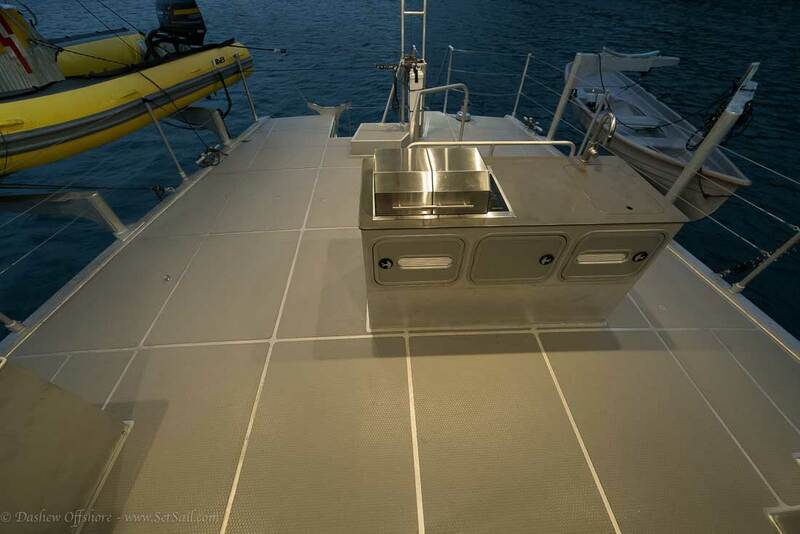 The same details which make the boat so efficient to keep cool also reduce heating requirements in high latitudes. 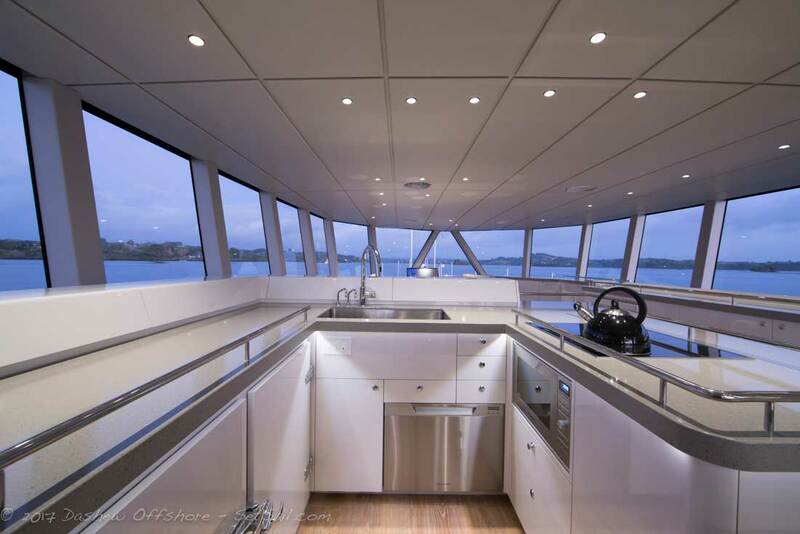 The aft deck area is enormous, the majority of it shaded by the roof overhang. To put the FPB 78 aft end into context, above is a photo of 78-1 with 16-ft AB RIB to starboard in its at-anchor out of the water storage position. One person can have the dinghy sitting on these rotating support arms in less than one minute. 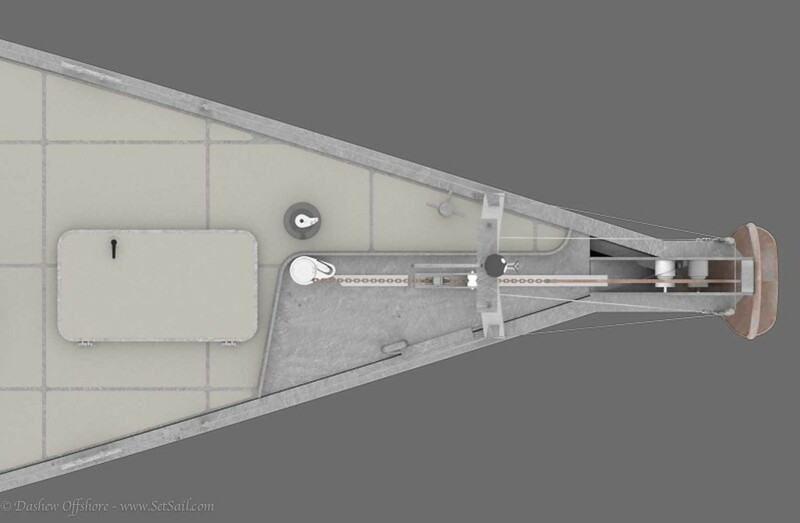 The 14-ft rowing dink is hanging from its davits, where it is easily deployed at anchor. Underway the davits are rotated inboard, and the dinghy sits on top, leaving the deck below clear. 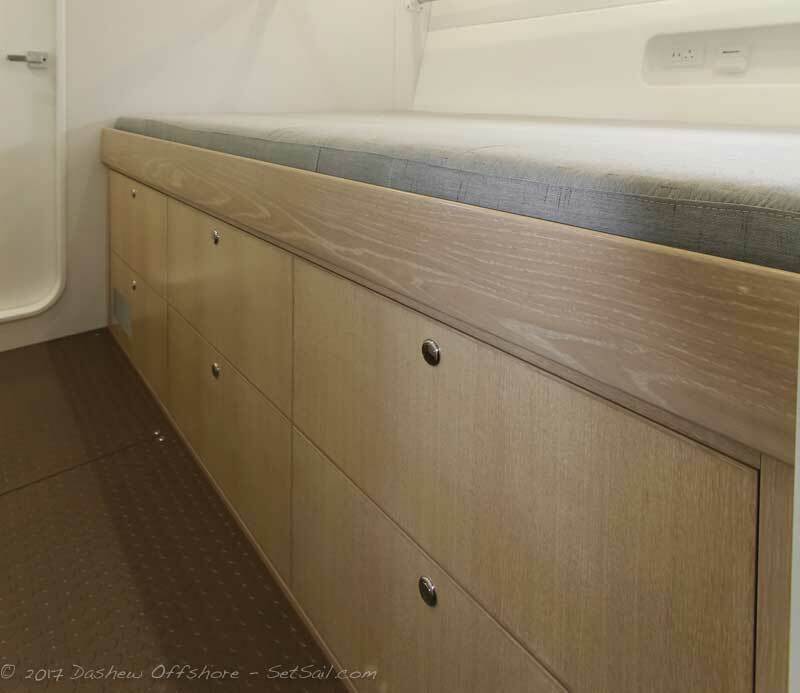 …food prep area, and large sink, with valuable storage space below. 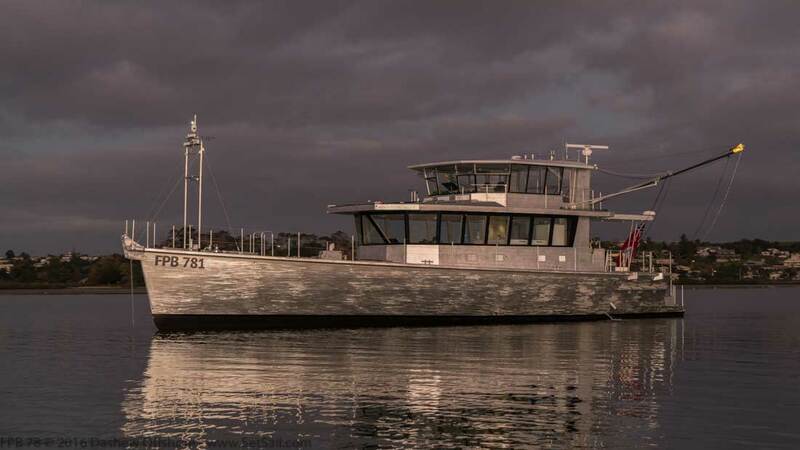 In a fleet designed for toughness, the FPB 78 is the meanest of the bunch. Bottom framing and plating are in excess of what would be considered ice class by Lloyd’s rules from the engine room forward, from the 24mm/1″ thick grounding plate, to the 16mm (5/8”) central turn of the bilge and engine room plate, not to mention the 12mm (1/2”) rest of the bottom. 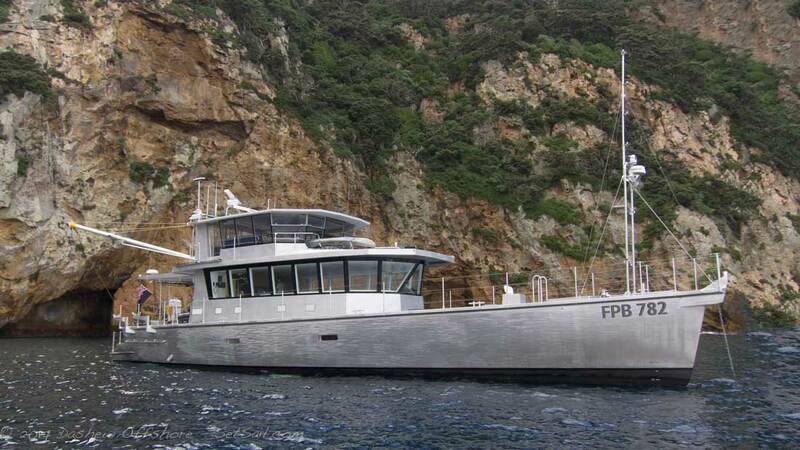 The FPB 78 is available with an MCA Category 0 rating, the most stringent standard under which a small yacht can be built. 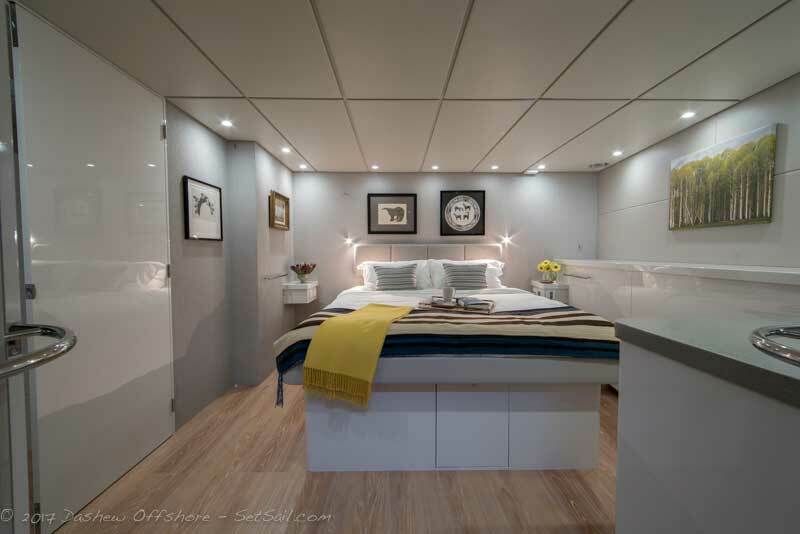 Although the paperwork is onerous for the builder, the benefits in terms of resale and insurance can be substantial (very few yachts qualify). Structural endurance is more than just plating and framing. 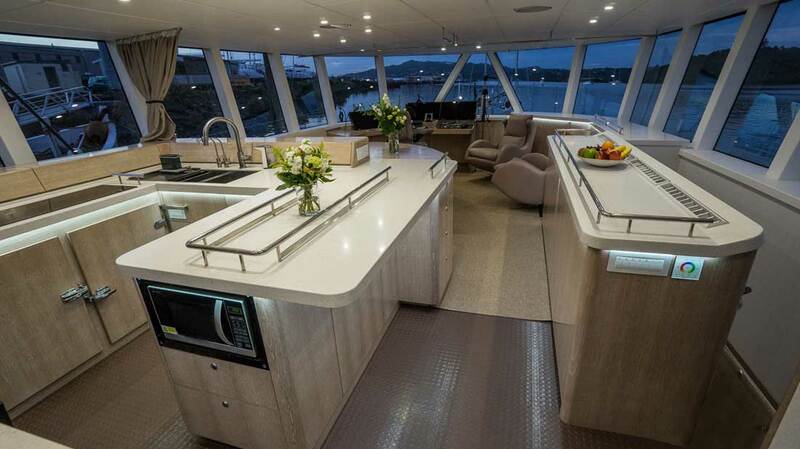 It comes from proper attention to the thousands of details which go into creating an FPB series yacht. The steering tiller, shown in the photo above, is typical of the FPB way of doing things. Rather than an adequate but subject-to-long-term-fatigue welded structure, our steering tillers are CNC-machined from a solid block of aluminum. Take a close look at this tiller, and then compare it to anything else you’ve ever seen on the head of a rudder on any vessel. This is what we mean when we say tough. FPBs also come standard with dual, isolated hydraulic steering systems, each with its own auto pilot and pumpset. FPB stabilizer installations are always contained within their own coffer dams. This approach has a demonstrated capability of dealing with high levels of operator error. The structure and planning for damage containment (that would send a conventionally built yacht to the bottom of the ocean) is simply the FPB way of doing things. Another example is the massively strong windows surrounding the great room: five layers of glass and structural plastic that is well beyond classification society requirements. The FPB approach to fuel and water tanks, using them to form in effect a double bottom for additional safety, creates 6,800 US gallons/25,800 liters of capacity, of which 70% represents fuel. Under normal circumstances 3,500 US gallons of diesel would be considered full load. The extra capacity is available for special situations such as extra long trips, or protection against supply disruption. Even with all this structural toughness, the ability to maintain high average speed is still the single most critical safety and comfort factor when voyaging in a small yacht. 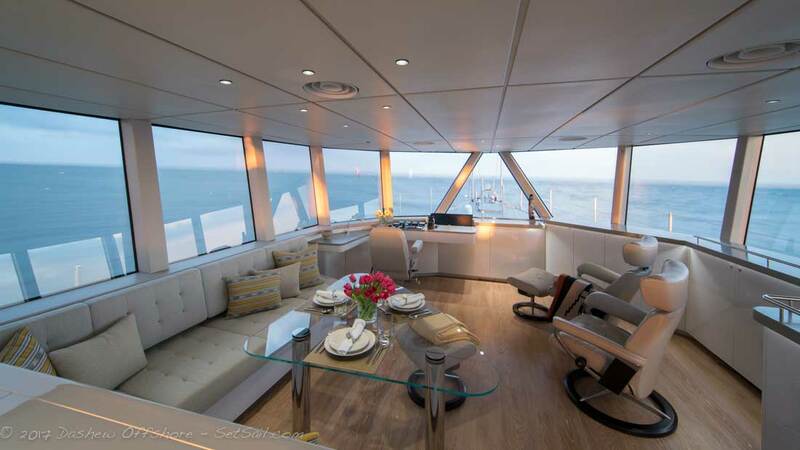 With full tanks, at 11 knots, the already proven FPB 78 range is in excess of 4,500 nm. This gives us our 11 knot cruise at a very smooth and quiet 1600 RPM. Sound level in the great room at this speed has been measured at 52db. Even though the odds of getting caught in truly severe weather are very low, every so often, a combination of factors–meteorological, navigation, systems or maintenance or operator error–lead to potentially devastating consequences. 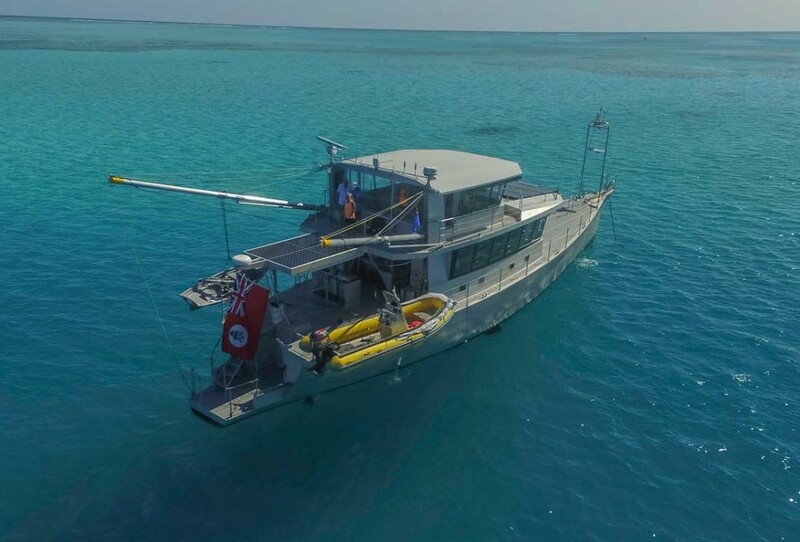 The reason we do things so differently than the rest of the marine industry, is because we have experienced what the ocean is capable of dishing out. In a world where so many boats stay close to home, FPB owners go everywhere. 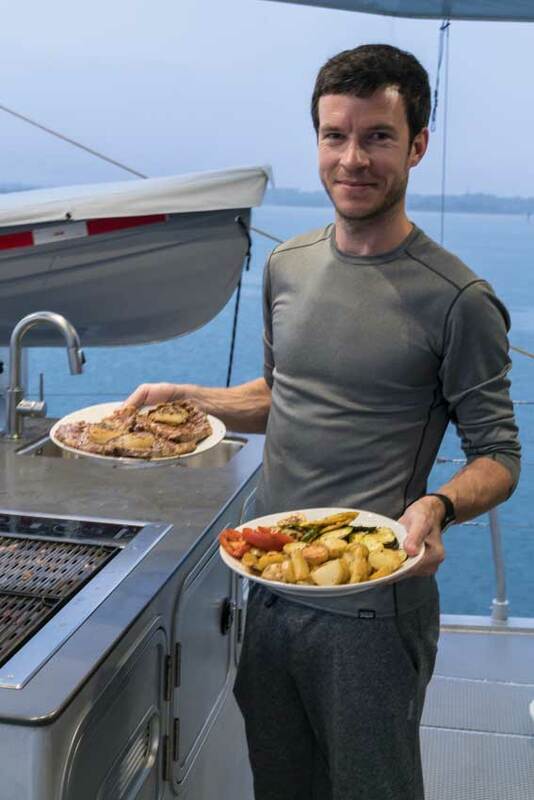 They put so many more miles on their yachts, see and experience so much more than the norm, because of comfort, speed and the emotional security that stems from the knowledge that FPBs have the toughest structural standards and systems reliability, coupled with unmatched extreme weather capabilities. Even the most cautious yachtsman has the confidence to seek out what lies over the horizon. Knowledge, the understanding that these boats do what they are supposed to do, gives you peace of mind. 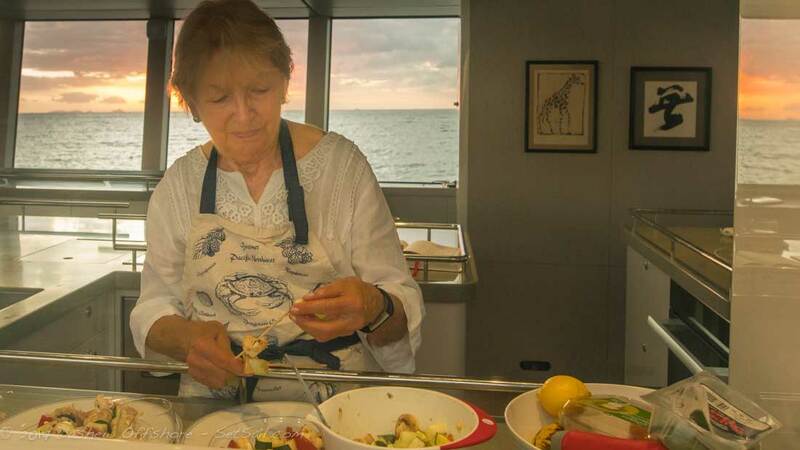 And peace of mind, in an uncertain world, is the secret to successful cruising. If you’d like to join us on this journey, contact Sue Grant: Sue.Grant@Berthon.co.uk. Click here to read more FPB 78 updates. Note: We have had literally hundreds of comments and dialogues surrounding our posts about the evolution of the FPB 78 design. We have compiled them all into one place for organization and ease of reading. Click here to see the dialogue. This entry was posted on Wednesday, May 24th, 2017 at 11:45 am and is filed under FPB 78, two. Both comments and pings are currently closed.